Why Did INV*GROWTH STOCK ADVIS Show up on My Credit Card Bill? Why is INV*GROWTH STOCK ADVIS showing up on my credit card statement? If your credit card statement reflects a recent charge from INV*GROWTH STOCK ADVIS, it signifies that you have recently signed up to receive the financial newsletter Growth Stock Advisor published by Investors Alley. • What is Growth Stock Advisor? 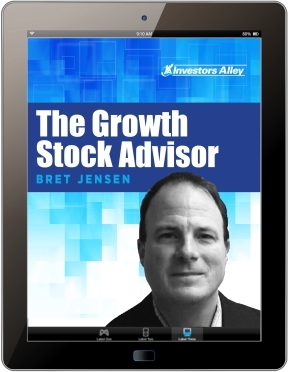 Written by Bret Jensen, Growth Stock Advisor delivers high-quality research on the best growth stock opportunities in the market today. This can sound a little over the top… I get all the ads from other newsletters, too.. But there’s a fundamental difference between those letters and mine: I buy the stocks I recommend. And if I believe there the odds are overwhelmingly in our favor for huge gains and I’ve got my own money in it, then you know I’ve got skin in this game. This is how I got to be in the top 5% of all analysts with Seeking Alpha and continue to drive in win after win after win. Of course, all positions are fully disclosed with every write-up so you know my personal stake ahead of time. As a former hedge fund manager and technology executive, I have years of experience identifying the best investments available and performing at the highest level. And, I will share that knowledge with you — in plain English — in every exciting monthly issue of Growth Stock Advisor. • Why don’t I recall ordering INV*GROWTH STOCK ADVIS? If you are a current subscriber and would like to access this report, Click Here. Or, if you have never read any of these reports and would like to sign up for a trial subscription to access them, Click Here. • How can I cancel Growth Stock Advisor? 1) Visit Investors Alley’s customer service website for Small Cap Gems by clicking here now or putting http://www.investorsalley.com/contact/ in the address bar at the top of your browser. 2) Or contact Small Cap Gems by calling 1-(855) 566-6100. The customer service toll-free number is open from 9:30 a.m. to 4:30 p.m. M-F Eastern Time and will only work for U.S. and Canadian subscribers. To learn more about the Growth Stock Advisor newsletter and our other publications, click here.